Not long ago I discovered a restaurant with prices similar to what it would cost me to assemble the ingredients at home. Growing up in Alabama, we didn't have Steak 'N Shake - they only recently began opening stores in the Birmingham area, and with just over 500 locations they are a fraction of the size of McDonald's. I knew very little about the company until its parent, Biglari Holdings, showed up on my radar as a potential stock investment. The company is now my top holding in my investment account, so fair warning: I own stock in the company I am writing about. If you were comparing nothing more than price, the cost of a Steakburger with Cheese, Fries and a Soda is roughly the same as a McDonald's Quarter Pounder with Cheese combo, possibly less. But have you tasted both? The CEO of McDonald's would be lying if he said his company's food tasted better. Steak N Shake offers a comprehensive $4 menu (sandwich and fries, no drink) with some bold tasting choices. 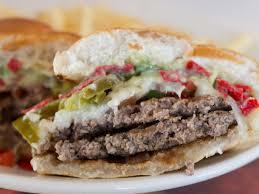 For example, the Nacho Cheese Steakburger has two patties, nacho cheese sauce, strips of tortilla chips and jalapenos. The Garlic Double Steakburger features a toasted bun with garlic butter brushed on and garlic salt atop the bun, along with two patties and American cheese. Just don't eat it before a job interview. Regular menu prices are comparable. Food is tremendously tastier. But it gets better. First, Steak N Shake sends out endless coupons. Some of those $4 combos become $3.49, and other premium sandwiches are discounted. Certain hours of the day (Happier Hour), milkshakes are half price. But that's not the most interesting way to save money. The real savings are in purchasing gift cards and using the mobile app to pay. Paying for your food using the mobile app gives you $5 for every $50 you spend, effectively a 10% discount on top of any other discounts you receive. For quite some time, the company has offered incentives for buying gift cards. Right now, for every $20 gift card you buy, you receive a $5 certificate. It's just crazy. I use the $5 certificate to buy two of the $4 combos, so I pay just $3 for two meals (and of course, I pay with a gift card). Essentially, you are getting $25 worth of food for $20, a 20% discount. That $4 combo is effectively $3.20 now. It's insanely cheap! I know this food isn't healthy, so moderation is key. But for prices this low, it makes more sense for me to hit the drive-thru at Steak N Shake than to prepare the same meal at home. Steak n Shake is similar to Freddy's which is my current favorite fast food place. I rarely go to Steak n Shake since there isn't one too close to me and they have table service if you eat inside. Having to tip a server makes it not so cheap. If there were one closer to me I would use your savings ideas for the drive-thru. In reply to comment on previous post. I have stayed one night at the Southpoint before. I don't remember if I did any gambling there. If I did it was for a short time since my stay there was very brief. I did like it though. I've seen Freddy's but never eaten there. Sounds like a cross between Culver's and Steak N Shake. We rarely eat inside, but I sometimes order to-go at the counter if the drive-thru line is long.